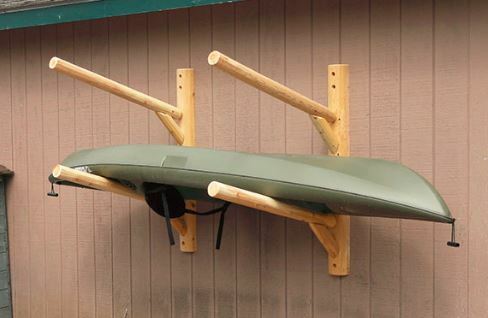 Ever wanted a kayak storage rack but never managed to find the right one? It’s that frustrating moment when you get home from that great day of kayaking, only to find that the hassle of storing your canoe is still there. There are easy solutions to your problem. Whether you need a freestanding kayak rack or a rack for your garage, or even you can build a DIY kayak rack. Probably the best way to store a kayak is in the garage. Come to think about it, I would not say the best, but definitely the most popular. Most of us living in a house, definitely own a garage. If you add in the kayak, the logical place to store it is in there. Even if it sometimes means not having enough space to park my car, I would definitely choose to have the car outside and the kayak in the garage. Otherwise, I would have to put the canoe inside the house. When thinking about reasons for canoe storage in the garage, I can come out with the most important ones. It is safer theft wise than outdoor kayak storage racks. Fewer people might steal it from your garage than from outside your house. Cold weather, rain or snow won’t directly damage your canoe. But with time, it definitely will. Depending on the material, it will happen sooner or later. Storing it inside is definitely a better choice. I have seen situations in which because of high winds the kayak fell or something heavier fell over it. That is definitely total damage beyond repair. Because of the reasons above, storing your canoe in a garage is just more practical and there are just fewer things to worry about. This support usually mounts on a wall or on other vertical surfaces. It will only hold 1 kayak and it does not have a paddle holder. Drilling is required and you need screws and fixing tools to mount them. This support goes on the ceiling and it should take the least space. It does not have a specific paddle holder but you can also store that easily on the support. You will need to do drilling and support fixing to the ceiling. Although you will find outdoor kayak storage ideas around, this comes with more downsides than storing kayaks inside. Usually, the outdoor kayak rack design has to provide you with a solution to some of the problems you will be facing. You should design the racking system in such a way that you are able to anchor the kayaks to it. This will reduce the risk of theft or at least discourage some people from trying to steal your canoe. The second issue you must handle is preventing bad weather from affecting your kayak. So you should create a protection method from rain, wind and also direct exposure to sunlight. All these aspects can affect the integrity of your kayak. 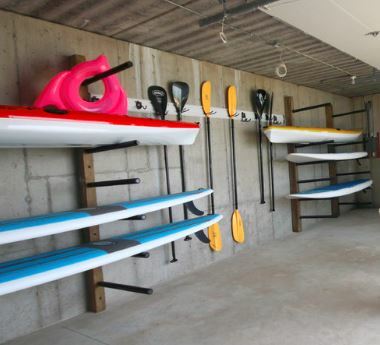 The ideal solution to store your kayaks is building a special shed. This means you are not using the space in the garage but you are still getting maximum protection for your canoes. It is what we would call a DIY kayak garage storage. 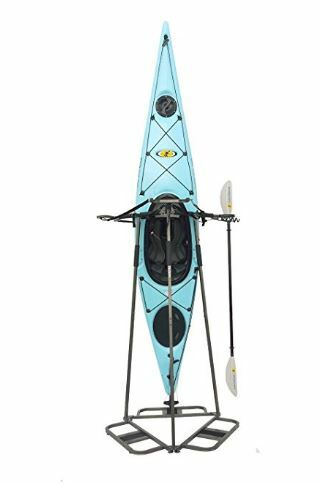 Freestanding kayak racks are great solutions to store kayaks because they don’t need a lot of work to buy, install or use. You usually just order them and the installation for them is pretty simple. Before you order a freestanding kayak rack, you will have to evaluate how big your storage space is. Because they usually sit directly on the floor, calculate carefully if it will fit your space and even more important, if you will have any space left after the install. Take into account that besides the space that racks take, you have to calculate how much space they will need with the kayaks racked. This means the actual free space you need is at least twice the size of the rack. The number of canoes you can store is another important aspect you have to take into account. Also, good quality racking systems for kayaks will show a maximum load capacity. Analyze both of these aspects carefully before you make the purchase. This support is pretty straightforward. You just connect the rails and you’re done. It supports 2 kayak racks and the paddles can be nicely stored. You can store them outside or inside depending on how much space you have available. This rack is an alternative to the above one, except that it will hold up to 6 kayaks. You can store outside or inside. Also, you can strap it to the ground so it’s not affected by powerful wind. Paddles are usually stored next to the canoe. 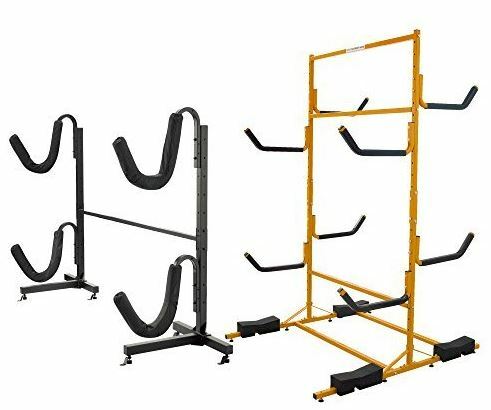 While a freestanding kayak rack has some similarities to a vertical kayak storage system, they are different approaches to the same problem. Vertical kayak racks are supposed to take less space and take advantage of vertical spaces. This solution can help you save a lot of space in a garage. You can also fit it outside easily and keep it away from bad weather quite easily. If you do fit it outside, don’t forget to anchor it to a static object, so the wind doesn’t overturn it. When you see one, you will definitely think it can’t store more than one canoe. But some systems will easily store 3 at a time, including specific spaces for accessories, such as paddle holders. The versatility of the system is very important. One system we saw, allows you to store 3 canoes at a time, or it can be used for paddle boats or even surfboards. This is great if you have both a canoe and a surfboard, but with limited storage space. Out of all the racks here, this is probably the most innovative. It holds up to 3 kayaks at a time. There are special paddle storage spaces so you won’t have to worry about them. It costs a bit, but if you can invest the amount, go for it, it is an excellent storage tool. Whether it’s DIY kayak garage storage or building a DIY outdoor kayak storage shed, such a project can be interesting for some. It will probably be the best path to having great storage, perfectly suited to your needs, but it also takes time. Kayak storage rack plans can be found online. There are numerous DIY projects for this purpose. So first step is planning and it’s maybe better to look at what others did and mix it with your own kayak storage rack ideas. Determine what materials and tools you will use in the process. If you are building a shed, this might need certain building permits. If you are looking just at a kayak storage hoist, things are much easier. Even a DIY kayak storage hoist requires some work. The execution of your plans will depend on the optimum use of the tools and materials you have. Try to follow the plans as well as you can, and you should be fine. If you do head down this path, and you want to learn how to make a kayak rack for the garage, a bit of experience is required for good results. Otherwise, you just risk building a bad system, or even worse, you could end up hurting yourself. As we see it, you can take different paths to for a storage rack for kayaks. Either buy one directly out of those available on the market, or build your own custom one.